Sometimes, sharing lunch with a friend is the best way to dine on a dime. Examining the online menu, I determined that I could have an inexpensive, balanced meal at Folino's in Shelburne — if I split the cost of a pie. 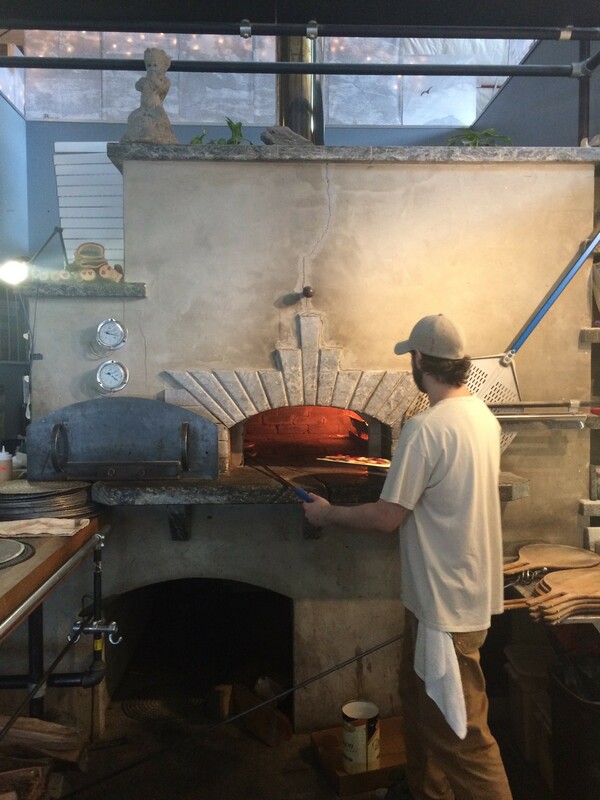 The wood-fired pizza joint is located on Route 7, in the same complex that is home to Fiddlehead Brewing Company. It also sits directly across the road from Shelburne Vineyard, which means that food tourists and locals alike frequent the spot. The proximity to local booze also means it is very easy to BYOB. Guests are invited to buy a growler or canned beers at Fiddlehead and tote them across the hall to drink alongside their pies. Folino's even provides frosty glasses to keep the brews cool. 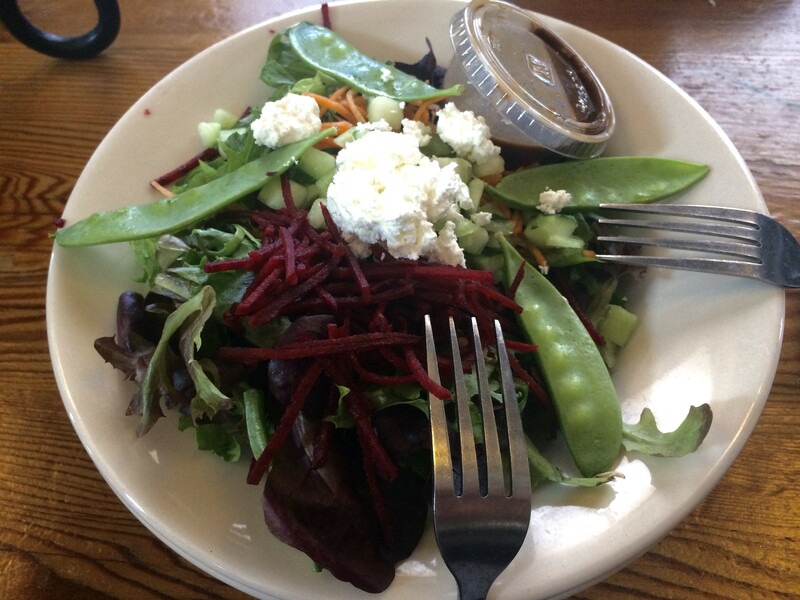 We started with the only non-pizza item on the menu: a green salad ($6.50) topped with peas, goat cheese and shredded beets and carrots, with a little cup of balsamic vinaigrette on the side. It's a simple combination, but the execution was pleasing. The peas were fresh and crunchy, and the culinary cliché that is beets and goat cheese is common for good reason. It was hard to decide on a pie — I was tempted by the chipotle-drizzled Fire Kracker Shrimp. 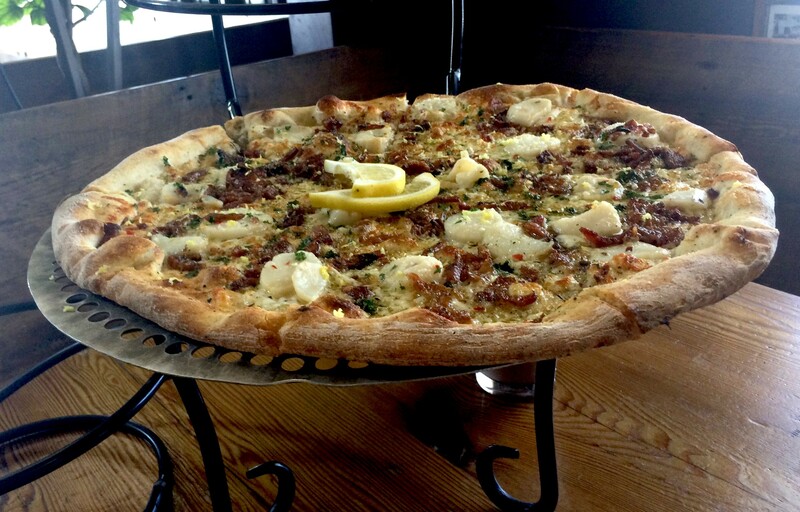 But we settled on a Surf and Turf white pizza with scallops, bacon and cheese ($17.50). The New Haven-style crust was excellent. It had just enough of the wood-fired character to add interest, but not so much that it tasted of char. Lemon zest gave the pie a surprising citrus-y kick. Scallops are so delicate that cooking them to perfection in a roaring hot oven can be tricky. If I had one suggestion, it would be cooking the whole scallops separately, slicing them, and tossing them atop the pizza before sending it to the table. The bacon and cheese were winners, as they almost always are. Overall, it was a fun and unusual pizza. I look forward to stopping by again, with even more friends, to try some Fiddlehead beer and a few more pies. P.S. After dividing the check, my half of the salad and pizza came to exactly $12 (before tax and tip).